The Fitted Diaries: Who the hell is John Chapman? Good afternoon fitted fans, and welcome to the only reason why Mondays are tolerable. Today, The Fitted Diaries features one of the most popular minor league fitteds in all of baseball. The cap you see above is the home on-field cap of the Fort Wayne TinCaps. The TinCaps are the new name for an old franchise located in Fort Wayne, Indiana. from 1993-2008 the club was known as the Wizards, and were affiliated with the Minnesota Twins and the San Diego Padres. Today, the team still remains connected with the friars of the west, as a member of the Midwest League of single-A baseball. New name, new mindset I suppose; since the teams name change (in honor of "Johnny Appleseed" or John Chapman) the club has found success in the confines of their new home. The teams new ballpark, as part of a complete franchise overhaul, is Parkview Field. Parkview Field is an 8,100 seat state of the art minor league stadium, which saw the team win their first, and to this day only, league and division titles. In the clubs history, it has seen such MLB greats as Jake Peavy, Torii Hunter, and LaTroy Hawkins (*not so great) develop in the system while on their way to the bigs. This season, former major league catcher Shawn Wooten will manage the TinCaps in hopes of another league title. Wooten was for the most part a career backup, who knows a thing or two about winning considering he was a 2002 world champion with the Angels. As most would figure, that kind of experience cant hurt a club; but only time will tell. 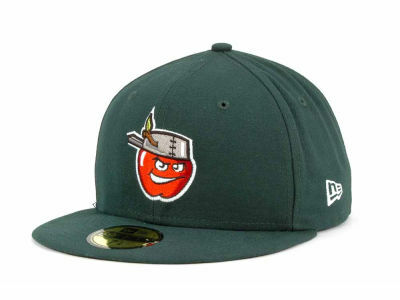 The cap above features a forest green brim and crown, with a caricature of an apple with a pot on his head in spirit of Johhny Appleseed himself. Based of the past success of the franchises' prospects, and the manager running the club this year lets hope the apple doesn't fall too far from the tree...pick up the cap at lids, or follow the link below.